EM’S brings you more, both in value and convenience. Wouldn’t be nice if you could do oil change and a car wash at the same place so you do not have to worry about unsightly dirt and grime covering your vehicle. At EM’S Lube you can. Conveniently hop over to our self serve 10-bay car wash and have your vehicle cleaned and detailed to complete your car maintenance. EM’S Lube offers fully equipped Self-Serve Car Wash next door to our Lube Shop. In addition to vacuum and full cycle was and rinse service service, we also take care of small detail that you may want to take care while washing and detailing your vehicle. 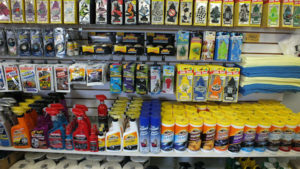 A quick step to our on-site convenience accessory shop and you can get all your car detailing accessories. Signup now to receive your special discounts, exciting news, and our amazing events!